Cocktail Hour and classic cocktails have been making a big comeback since last summer and non more so than the Martini. A Martini is a wonderful and refreshing pre-dinner cocktail and whilst it is really easy to make there are a plethora of different options. Gin or Vodka? Which ones and how much do you use? Vermouth left in or out? Shake or stir? Olives or citrus twists? Glass shape? Decisions decisions. 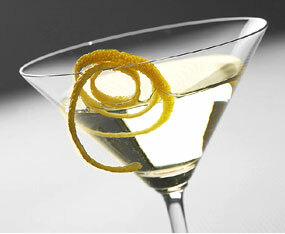 Bona fide Martinis should look good, smell fabulous and taste delicious. So how do you make a good Martini? In Casino Royale, James Bond likes his Vesper Martini (see below how to make one) shaken not stirred, but there’s been an increasing popularity and return of the Classic Gin Martini, the historical base. So what do you need for a Classic Martini? Chill your cocktail glass first. Fill the mixing glass with ice and pour over your Gin and Vermouth. Stir for about 25/30 seconds. (Alternative, put a small amount of Vermouth into the cocktail glass before you pour in the Gin/Vermouth, swirl it around before emptying it out for a dry Martini, leaving it in for a wet Martini). Place the strainer over the top of the mixing glass and pour into the chilled cocktail glass. Lemon Twist Garnish: lightly squeeze the twist of lemon over the top of the cocktail glass and then rub the lemon twist around the top of the glass before gently placing it into the cocktail. Olive Garnish: place an olive gently into the chilled cocktail glass. For a dirty Martini, add a little olive juice. Chill your cocktail glass first. Fill the mixing glass with ice and pour over the Gin, Vodka and Vermouth. Shake well until its ice cold. Strain and pour into the cocktail glass adding a large slice of lemon peel. ← Tis the season to be merry with this easy yet perfect mulled wine recipe…..
Love a dirty vodka martini with blue cheese olives! Ohhhh yes. Great taste Andrea. Absolutely delicious! !